Royal Caribbean International, the award-winning cruise company revolutionising the travel industry with its innovative ships, has announced Tonga as a brand new destination for its upcoming 2016/17 season. Radiance of the Seas, nicknamed the “culinary ship” for her rich variety of onboard dining options, will call at the stunning Tongan ports of Vava’u on 12 December 2016 and Nuku’alofa on 13 December 2016 for the very first time. The two new destinations will be part of a 13-night South Pacific, Fiji and Tonga journey. Fares start from $1,599 per person for an Oceanview Stateroom on the exotic cruise, which begins in Sydney on 3 December 2016 and calls at the Isle of Pines in New Caledonia, Lifou in the Loyalty Islands, Suva and Lautoka in Fiji, as well as Tonga, before arriving in Auckland. “We’ve had our eye on Tonga as a destination for our guests for some time, with its vibrant culture, diverse marine life and stunning natural beauty,” says Adam Armstrong, managing director for Royal Caribbean International in Australia and New Zealand. The two new destinations will bring a host of unique experiences to the table for Royal Caribbean – the islands of Vava’u are renowned for their coral gardens and sparkling lagoons, while Nuku’alofa, capital of Tonga and home to the only royal family in the Pacific Islands, is a thriving hub of island charm and regal tradition. Guests will have the opportunity to explore the islands further with a range of optional excursions, including whale-watching and snorkelling in Vava’u and a cultural tour in Nuku’alofa. Radiance of the Seas will also make the cruise line and industry’s maiden call to Wollongong on 30 October 2016. The 2,400-guest Radiance of the Seas will make Australia her home for the sixth consecutive season this summer, bringing with her 16 international onboard restaurants, cafes and bars including Izumi Japanese restaurant, Giovanni’s Italian restaurant, Chops Grille steakhouse and the elegant Champagne Bar. 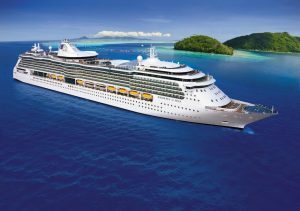 Radiance of the Seas is one of five Royal Caribbean ships to sail around Australia, New Zealand and South Pacific region in the 2016/17 season. For further information or to book a Royal Caribbean cruise, visit www.royalcaribbean.com.au, phone 1800 754 500 or see your local travel agent.